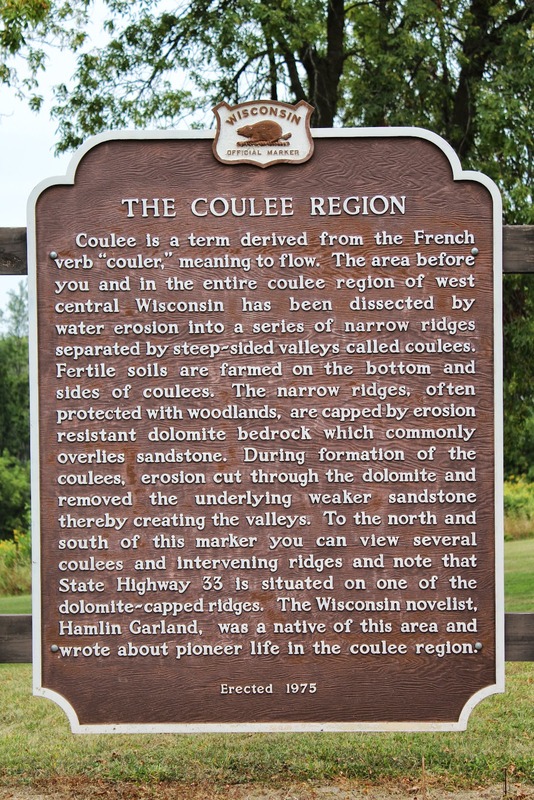 Coulee is a term derived from the French verb "couler," meaning to flow. The area before you and in the entire coulee region of west central Wisconsin has been dissected by water erosion into a series of narrow ridges separated by steep-sided valleys called coulees. Fertile soils are farmed on the bottom and sides of coulees. The narrow ridges, often protected with woodlands, are capped by erosion resistant dolomite bedrock which commonly overlies sandstone. During formation of the coulees, erosion cut through the dolomite and removed the underlying weaker sandstone thereby creating the valleys. 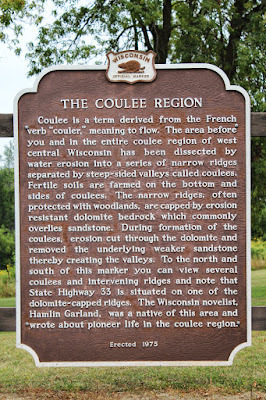 To the north and south of this marker you can view several coulees and intervening ridges and note that State Highway 33 is situated on one of the dolomite-capped ridges. 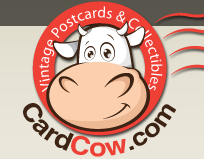 The Wisconsin novelist, Hamlin Garland, was a native of this area and wrote about pioneer life in the coulee region. 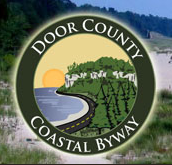 The marker is located at a scenic overlook on County Highway OA, near W4210 State Highway 33, La Crosse, Wisconsin 54601.